After canvassing the returns of the November 8 election, Robert Doc Williams, Chester Gonzales, Jack Harrison and Raul Roy Morales were acclaimed winners in the Jourdanton City Council race. Williams was sworn in as Mayor, with Gonzales, Harrison and Morales sworn in as council members. The breakdown of the votes was: Williams, 660; Gonzales, 546; Lewis Lem, 385; Morales, 578; Patricia J. Elizabeth Tymrak-Daughtry, 307 and Harrison, 497. As his first act as mayor, Williams gave Susan Netardus a servce award for her 10 years of loyal and dedicated service on the council. She was also given her gavel, which had been engraved for her four years as mayor. Williams thanked the citizens of Jourdanton for coming out for the city elections: Harrison said he had to stand in line to vote and it was great to see such participation. The first item of business was the approval of the consent agenda which included the minutes from the October 17 meeting and the payment of the bills. 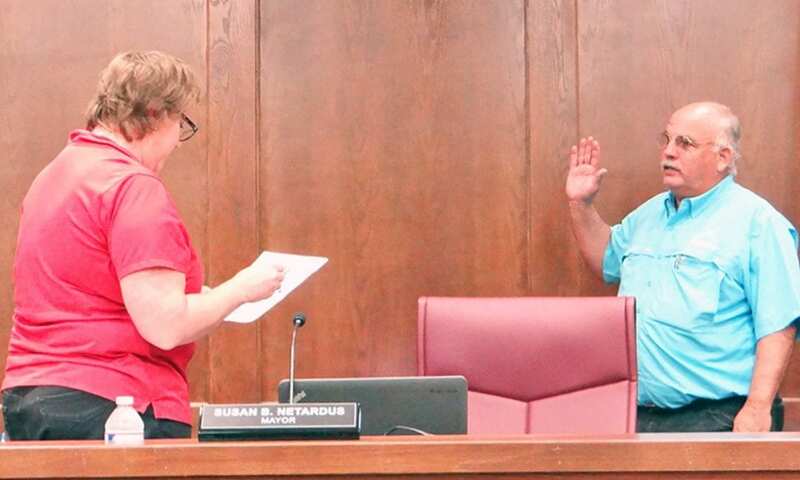 Morales moved to approve the agenda, Karen Pesek seconded. Motion passed unanimously, with Johnette Goetzel also voting affirmative. A special use permit was unanimously awarded to Teylor Mann allowing him to move a manufactured home onto the property at 805 Palmetto Street. Morales said that he thought it was neat that a young citizen wanted to stay in town. There was some discussion before awarding a special use permit for property located at 2503 Brown Avenue. The plat that the council was given shows that the mobile home will be situated on one lot by itself and Harrison voiced concerns that the other lots might be sold and would be in violation of the ordinance. Jon Mutters, the owner, said that the placement of the home was not shown correctly. City Attorney Dan Santee assured the council that if a sell were to happen, it would result in the whole thing being negated and the mobile home would have to be removed. Motion was made by Pesek, seconded by Morales and passed unanimously.